Customer service is being disrupted in the same ways that marketing has been disrupted: mobile, social, Millennial behavior shifts. We talk about marketing disruption A LOT. We talk about customer service disruption just a little. As a result, most companies are using 1995 playbooks to solve modern customer service issues. We have to do better. 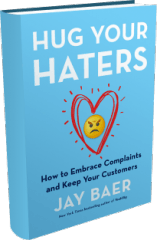 This outstanding infographic that collects 23 statistics — many of them from my new book, Hug Your Haters – about why and how customer service needs to change NOW.